When I developed Anorexia Nervosa, at age 11, diary-writing became a survival tool. Since recovering self at age 55 in 2006, I have written seven books, combining life experience and professional skills to disseminate evidence-based research for health practitioners and mainstream readers. A global mental health advocate, her website supports this work and she presents workshops on writing as therapy. I am a PhD candidate in Creative Writing at CQUniversity, exploring how diary writing can be therapeutically applied in healing from eating disorders. My writing passion is balanced with love of nature, family and friends. •	2010	Recipient international scholarship, Academy of Eating Disorders Conference, Salzburg, Austria; recognition of writing to raise eating disorder awareness. •	2015 AED Patient Carer Committee travel award recipient, for attendance at ICED, Boston. •	2015-ongoing: APA Scholarship Award to help meet living costs while undertaking PhD. •	2013 Two months research in UK, USA, Canada, interviewing researchers at Maudsley Hospital London, UCSD in San Diego, and Hospital for Sick Children, Toronto. Also 17 families, including children with eating disorders, as research for book on multi-family-based therapy (co-author, Prof. Ivan Eisler). Funding for trip provided by The Butterfly Foundation. •	2011 Presenter on Hope at Every Age - National Eating Disorders Association annual conf., Hollywood with co-presenter Renee Rienecke Hoste, Ph.D., (formerly University Chicago Eating Disorder Program, now assistant professor and Director of Clinical Services and Research of the U-M Comprehensive Eating Disorders Program). •	2010 Address to National Eating Disorders Association (NEDA) conference, NYC, and eating disorder research teams at University of Chicago and University of California (San Diego). •	2012-2013 At Home with Eating Disorders - On main committee and co-chair of program committee for Australia’s inaugural national conference for families/carers and sufferers of eating disorders, Brisbane, May 23-25, 2013. •	Life-writing mentor for Gippsland residents affected by Black Saturday bush fires, producing two social history books 'I Remember When' - at Yarram and Gormandale. •	2010: Life-writing mentor for Gippsland residents affected by Black Saturday bushfires, producing Down Memory Lane in Yarram. •	2006: Editor of Tucker ‘n’ Tales, social history of women who settled in the Latrobe Valley region of Victoria. •	2002: Author of Australian Yarn Art, Knitting Stories and Designs, published by Crown Content, Melbourne. Launched at Bendigo Sheep Show. •	2001 Author of Heartbeat of the Country a social history of rural Australia, 1931 to 2001. HWT publication. •	A Clinician’s Guide to Binge Eating Disorder. Co-editors Andrea Goldschmidt, Daniel Le Grange. Routledge 2013. •	Anorexia Nervosa: A Recovery Guide for Sufferers, Families and Friends. Co-author Janet Treasure. 2nd edition: Routledge 2013. •	Ed Says U Said – Eating Disorder Translator. Co-author Cate Sangster. Jessica Kingsley Publishers, UK, 2013. •	A Collaborative Approach to Eating Disorders. Co-editor Prof. Janet Treasure, Routledge. 2012. •	Memoir A Girl Called Tim, Escape from an Eating Disorder Hell, NH Publishers 2010. •	My Kid is Back - Empowering Parents to Beat Anorexia Nervosa. Co-author Prof. Daniel Le Grange. Routledge. 2010. •	Current work: Multi-Family Therapy for Eating Disorders – My Family is Back, co-author Prof. Ivan Eisler, King’s College, London. Routledge (UK) due for publication 2016. (Two months research 2013 in UK, USA, Canada). •	Using Writing as a Therapy for Eating Disorders – The Diary Healer. Routledge (UK) 2016. Publisher: Routledge (New York). Publication Date: 2016. I was given this chapter title: A life wasted: a patient’s perspective. •	Alexander. J., McAllister, M., Brien, D.L. (2015). Exploring the diary as a recovery-oriented therapeutic tool (November 2015 online: DOI: 10.1111/inm.12179) International Journal of Mental Health Nursing (In Press). •	McAllister, M., Brien, D. L., Alexander, J., & Flynn, T. (2014). Exploring the educative potential of eating disorder memoirs. Journal of Mental Health Training, Education & Practice, 9(2), 69-78. •	McAllister, M., Brien, D. L., Flynn, T., & Alexander, J. (2014). Things you can learn from books: Exploring the therapeutic potential of eating disorder memoirs. International Journal of Mental Health Nursing. 1. 2016: Workshop presentation with Timothy Brewerton and Jenni Schaefer at Academy for Eating Disorders (AED) ICED, San Francisco, May 4-7. Workshop title: Trauma, PTSD and Eating Disorders: Integrating Personal and Professional Perspectives. 1. Presentation of half-day This is Your Story workshop on diary writing benefits for carers, at Australia’s second national carer conference for parents and partners of loved ones with eating disorders. May 2015, Melbourne. 1. Attended Academy of Eating Disorders annual conference (ICED) in New York, March 26-30th. Attended 19 meetings/conducted interviews relating to book research. 1. Co-presenter with Prof. Janet Treasure (King’s College, Maudsley Hospital) on Working with Carers with a Brain-based Approach to Eating Disorders. At Home with Eating Disorders Conference, Brisbane. May 25th. 2. Co-presenter with Prof. Cynthia Bulik (University North Carolina) on Midlife Eating Disorders: The Recovery Journey for Adults and their Partners. At Home with Eating Disorder Conference, Brisbane, May 24th. 3. Alexander, J., Paxton S (2013, April) Co-presenters, address on ‘Reflux and related diseases’ at Melbourne Convention and Exhibition Centre, 35th Australian Dental Congress, theme ‘Facts, Fiction and Fantasy’. Melbourne. 3. 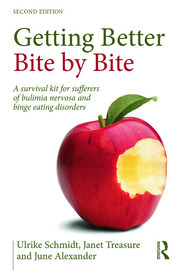 Book review: A Collaborative Approach to Eating Disorders, edited by June Alexander and Janet Treasure. London: Routledge, 2011, 344 pages.